Join architectural historian Ken Charlton and conservator Emily Birks to learn about the work and life of Alberto Dias Soares, and the conservation of some very special objects being offered to Canberra Museum and Gallery (CMAG) and the ACT Heritage Library. Image reproduced from God’s Architect The churches and parsonages of Alberto Soares, Grae me Barrow, 2016. Rev’d Canon Alberto Dias Soares was a prominent Anglican clergyman who designed over 30 churches, parsonages, schoolhouses and halls from the mid to late 1800s. Many of his buildings still stand in the Canberra region including Christ Church, Queanbeyan and extensions to St John’s Canberra. 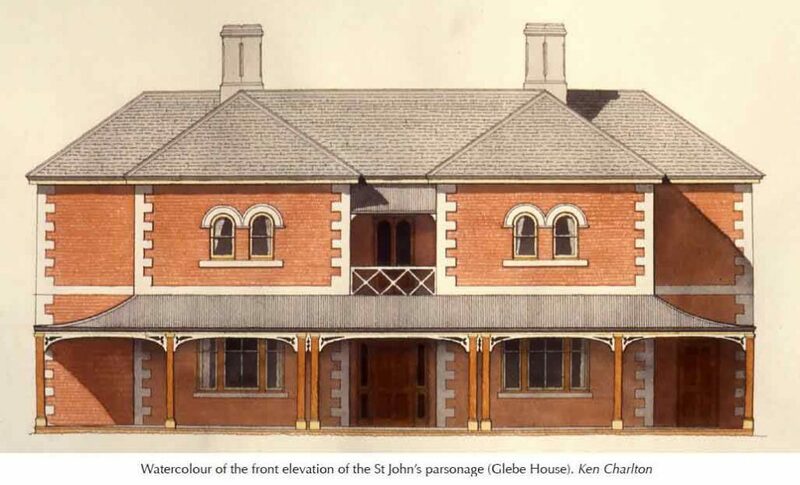 Soares was also the architect of St John’s Parsonage, Canberra in 1873, illustrated below. Vacated in 1926, it was renamed Glebe House, but being in the way of a planned road, was demolished in 1954. Conservation has commenced on a collection of significant objects associated with Soares’ life and practice. The collection has kindly been offered for donation by Ralph and Denise (Slater) Sutherland, descendants of the late Mr Ed (Ederic) Slater (1923-2017) the godson of A D Soares’ daughter, Rosa. CMAG is delighted to partner with St Mark’s National Theological Centre Library, which holds its own important Soares collection, and local materials conservation practice Art and Archival to present these two insightful back-to-back talks exploring Soares’ contribution to the ecclesiastical architecture of our region, and the conservation of the objects on offer. A sample of Soares material including drawings from St Mark’s National Theological Centre Library will also be on display. Introduction by ACT Minister for the Arts and Community Events, Gordon Ramsay MLA. Admission $10, includes refreshments on arrival. For more information, call 02 6207 3948 or visit the Canberra Museum and Gallery’s website.